Food manufacturers use a chemical process called fat hydrogenation to alter some of the monounsaturated and polyunsaturated fats in the products they make. 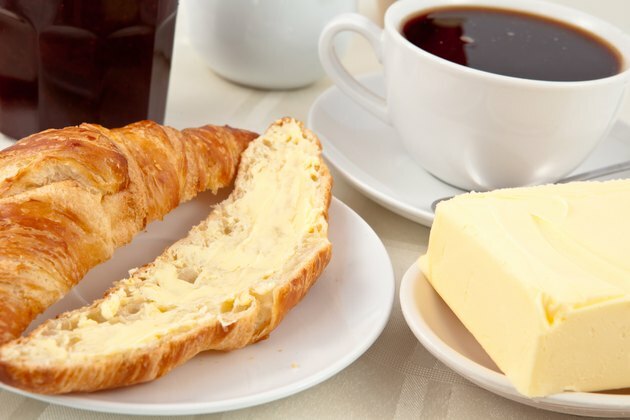 Hydrogenated fats are what the food industry calls functional ingredients because they serve a purpose other than improved product quality or nutrition. Hydrogenated fats are more stable than unaltered unsaturated fats, so fat hydrogenation increases the shelf life of foods. Unfortunately, consumption of hydrogenated fats increases heart disease risk. Since heart disease is the leading cause of death in the United States, this is a serious disadvantage to fat hydrogenation. The vegetable oils used to make many foods such as cookies are made of a mixture of saturated and unsaturated fats. Unsaturated fat molecules normally have a cis configuration, which means that the groups of atoms at each end of the molecule's carbon-carbon double bond are situated on the same side of the molecule. The process of hydrogenation adds hydrogen atoms to the fat molecules, changing them to a trans configuration. This means that the groups of atoms at each end of the double bond are now on opposite sides. The unsaturated fat cis molecules accept oxygen atoms easily. When oxygen atoms join the fat molecules, the fat breaks down and the food becomes inedible. The trans molecules produced by fat hydrogenation don't accept oxygen readily and are much more resistant to oxygen-triggered breakdown. This substantially increases the shelf life of prepared foods. Foods with longer shelf lives save food companies money because they can be stored at room temperature for longer periods of time during shipping and warehouse storage. Consumers also prefer food that they can store in their cabinets and eat weeks or months later. Unfortunately, the human body cannot use trans fats the same way it uses natural unsaturated fats. While a small amount of unsaturated fat is good for you, no amount of trans fat is healthy. Trans fat raises the levels of low-density lipoprotein, or LDL, cholesterol in your blood. LDL is the "bad" cholesterol that clogs your arteries. If you eat a lot of trans fats, they can also lower the levels of high-density lipoproteins, or HDL, cholesterol in your blood. HDL is the "good" cholesterol that helps prevent LDL from sticking to the walls of your arteries. So, in addition to being a high-calorie ingredient, trans fat also poses a heart disease risk. In order to keep your cholesterol levels in check, the Centers for Disease Control and Prevention recommend avoiding trans fat. Since regulations required food manufacturers to start listing trans fat content on their labels in 2006, you can check food labels to avoid or minimize your trans fat intake. Check the "Nutrition Facts" portion of the label for trans fat content. If you are deciding between two foods, pick the one with fewer grams of trans fat. Ingredients such as "hydrogenated" or "partially hydrogenated" oils are also red flags for trans fat. Also remember that spreadable margarine usually has less trans fat than sticks, since hydrogenated oils are more solid than unaltered vegetable oils.